My neighbors were no help whatsoever. One ran into her house and slammed the door. Another was home, and later told me he had heard something, but didn’t feel he could come outside to see what was going on. The third watched from across the street as I staggered out onto my porch, then turned around and walked into his house. No one called the police. We got an alarm after that. It didn’t help. The next set of burglars ripped it out of the wall. Our neighbors were once again home, and did nothing. The police came twelve hours later, after repeated calls. We barred the windows completely after that and we take our electronics with us when we leave. Not that we have much left. We were never able to replace our laptops or the video cameras my partner was hoping to someday make a living with, times being what they are. The cats set the alarm off last month. The police were called, and never came. We got home three hours later and had the alarm company cancel the police call. I filed a complaint against the police department and my partner talked to the neighbors. Once again, some people had been home and no one had even bothered to check, let alone call the police. Filing a complaint was all we could do, really. Yesterday I received a bill for a false alarm. Today, I called the officer in charge of our complaint and was completely stonewalled, as I had been when I filed the complaint. They respond to calls according to a priority system and property crimes are lower priority, et cetera, et cetera. And he had no way to deal with the bill, that was something I’d have to take up with the city of Oakland. It took an hour or so, but I found the right clerical at last, and she was very helpful. My second call had been to the alarm company to get the documentation of what had happened. All I need do is send it to her and the bill will be canceled. Between the file I made of everything I’d done, all the phone calls I had to make, and the navigation of various systems, I’m out two hours and a day of busking. I saved myself almost $100 in fines. The anger and frustration is gravy, and the fear of leaving my house unguarded every day is something I’ve lived with for the last couple of years. The damage to Oakland is multiplied by all the other homeowners who are in the same position I am, and it is completely unnecessary. In our neighborhood, one house is probably causing most of this. Every house has an alarm on this block, and several of us have been robbed, some more than once. After the first burglary, I saw the man who assaulted me. He saw me too, the way he ducked down on his porch proved that. I did my best to just walk along as if I hadn’t seen him, but as soon as I got around the corner I called the police. After all, they had his fingerprints. I was now able to give them his address. They asked me what I wanted them to do about it. And then they stonewalled me. The neighbors at the time knew of him, they called him “skinny guy.” None of them, even those who had been robbed by him, were willing to talk to the police. This is a microcosm of the problems that face us all today. We all know what needs to be done, we just don’t want to do it. As neighbors, we need to pay attention to what goes on. We need to check on each other and call the police when necessary. We need to act as if this is home, and as if our actions matter. The apartment building next door had a robbery averted about four years ago. We heard the break-in and asked, loudly, over the fence, what was going on. The burglar ran. We called the police. It was simple, and it’s what neighbors do, right? Our actions matter. Just because we can’t solve the whole problem is no reason not to do what we can. Just because we don’t have the power to change things we know are wrong is no reason not to speak up. I can’t clean the whole beach, but I pick up trash all the time. Not all of it, just some, but I leave it a better place than it was when I got there. That’s all I have to do, I only have two small hands. That’s all any of us have to do. Is what we are about to do part of the problem, or part of the solution? That’s the only question we have to ask. I got an apologetic call back from the police officer who stonewalled me this morning. He said that the bill was their mistake and he would have it cancelled. I didn’t mention the fact that he’d told me of his powerlessness to do just that this morning. I thanked him and I am quietly planning the next step. Until we can get out of Oakland we will continue to do whatever we can to make it a better place. It isn’t about any individual police officer, it’s about a system that does not respond to the needs of their citizens. It’s about a city government that cuts services and at the same time institutes more fees and fines on their citizens. $25 a year for an alarm permit. An $84 fine for a false alarm. A $25 appeal fee to protest such a fine. And it goes on. Every crime not investigated, every neighbor who turns a blind eye when someone is hurt, when someone dumps another sofa on the corner or throws another bag of trash out of a moving car makes Oakland a poorer place. Poor isn’t about money, not really. I was taught the difference between being short of money and being poor. I was also taught that good taste costs no more. it’s about learning to cook, about making things last and buying only what you need. It’s about reaching for the stars even when you’re living in a tagged trash can of a neighborhood. It’s about feeding your head, spending that bus ride with a library book instead of sprawling across two seats and scowling at everyone who passes. Our house may be filled with secondhand furniture but it’s also filled with a well read library. We may not be able to afford to eat out much, but the house smells of a well made stew that will provide us with lunches for the week and the chicken whose bones provided the stock is waiting to be roasted for dinner. We are wealthy, and it’s a wealth everyone can have–and should. We’ll be leaving Oakland as soon as we are able. It’s sad, really. Our first home together was six blocks from where we live now and we’ve moved all around the East Bay since. Oakland is beautiful, a place of fine old houses and with an urban forest as diverse as the people who live within it. 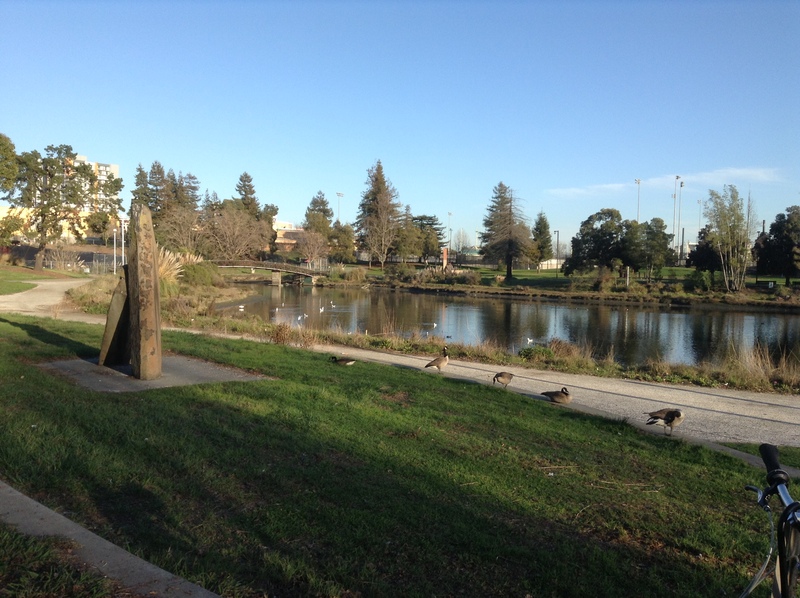 Lake Merritt is a jewel and the estuary that feeds it is one of the finest city birdwatching sites I’ve ever seen. But in nearly thirty years it hasn’t changed one bit, except possibly for the worse. I’m tired, and I’m not willing to invest any more of my life in this place. But I wish it well, it deserves better. All it needs are people who care, and are willing to get involved with what goes on around them. Hugs, sister. It’s sad, but I sincerely hope you get the opportunity to move, soon. No one should have to live like that. The very least thing to do is look out for one another. I do what I can and hope for change, in so many ways. Ugh. It was like that when I lived in Rockford. Apathetic cops, not enough for the area and population, and people not giving a dman. I’d never experienced a non-response until I lived there. I wasn’t going to ignore the upstairs neighbors’ domestic nightmares, what if somebody got seriously hurt or killed when the furniture went flying? I knew too many people who’d say “eh, not our business, it’s a city” or something. OT: I stumbled on another BART while looking at various transit options: bus service in a remote area in far northern WI. Rural places and small towns could use a similar model. *Everybody* could use a decent transit option. But I am becoming evangelistic. Is that you, Moon?